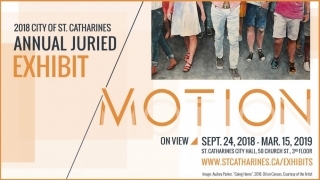 “Motion” called upon artists to consider what movement of everyday life in our community looks like. This exhibit provides the audience with an opportunity to consider what the process of movement means to them in their community. How does it feel? What does it sound like? What objects or infrastructure enable this transportation? Fifteen local artists demonstrate what “Motion” in the City means to them through their work.